a traditional ‘Paste Wax Polish’, is an excellent example. Early furniture finishes, applied by hand or pad, were expensive to complete. Paste wax was found the best means to maintain finish integrity and provide long-term protection. The English know that the best protection for wood finishes is a maintained layer of “wax polish” that will absorb abrasions, repel dust and protect against humidity. A good Furniture wax (applied sparingly) is easy to apply and buffs to a warm glow with ease. Antiquax Fine Furniture Wax Polish was originally formulated in the early 1900’s, by master woodworker Mr. Elliott of London for protection of his furniture finishes. In 1922 he approached Partridge Fine Arts, an antiques gallery in New Bond Street, London and asked them to sell it for him. 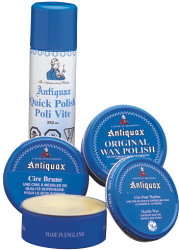 The Original Antiquax Paste Wax Polish formula is manufactured today in Manchester, England. Antiquax is used by, museums, fine furniture collectors, estates, and furniture crafters around the globe. Antiquax Wax should NOT be used on floors. is too slippery to be safe as a floor wax. For floors, use a Non-Slip Floor Wax.